From the cartel clocks of France and the cuckoo clocks of Germany's Black Forest to the banjo clocks of America and the wag-on-the-wall clocks of England, antique wall clocks were among the first clocks made for personal home use. Wall clocks made from the eighteenth century through the early part of the twentieth century are highly sought after by collectors throughout the world. Over the years, clockmakers and manufacturers produced a wide variety of clocks in a great number of styles and designs. In French the word cartel means frame. Cartel clocks are actually clocks housed in exquisite French frames of the eighteenth century. Cartel clock frames are often wood covered with gorgeous gold leaf or made of highly decorated cast bronze. The dials are generally white with gilt figurines, cherubs and garlands surrounding Roman numerals. Mostly Clocks shows fine examples of cartel clocks with signed dials from famous French clockmakers including Courtois H.ger Du Roi Sui La Cour, Ghiout L'Aine a Paris and Jean B. Helye, Reu Nueve St. Mederic. An elaborate and ornate French cartel wall clock from the late nineteenth century is found on Selling Antiques. Although the most popular type of antique cuckoo clock is the one shaped like a little cottage or house made during the nineteenth century, cuckoo clocks actually date from the 1730s. The first one was designed and crafted by a German clockmaker from the village of Sconwald in the Black Forest, Franz Anton Ketterer. This type of antique clock is considered a novelty wall clock. The Clocksmith carries fabulous vintage and antique cuckoo clocks dating from the nineteenth century and early part of the twentieth century. One of the most popular styles of wall clocks of the time, the banjo clock, was first designed by Aaron and Simon Willard in 1802. New England clockmakers quickly followed the idea of making the uniquely shaped clock, originally known as the Improved Timepiece. It was not long before banjo shaped clocks in a variety of variations were being made. The unique clock style remained popular for more than sixty years and is one of the most collected styles of antique clocks today. Banjo clocks have an eight-day brass movement and many feature reverse paintings, beautiful wooden cases and brass eagles or other figures. It must be noted that there are many fake Willard antique banjo clocks on the market. Many of Willard's clocks were never signed and his name is being added to unsigned clocks of other clockmakers of the nineteenth century. A rare banjo clock which may be an original by Willard is shown on 1-800-4- clocks. The dial is signed Aaron Williard and it features an unsigned movement typical of Willard clocks. An early banjo clock by William Cummings, a famous apprentice of Simon Williard, is found on Go Antiques. The English wag-on-wall clocks were popular during the mid nineteenth century. This style clock has the dial, movement, pendulum and weights, but there is no case. The clock was made with a top hood to protect the clock works from dirt. 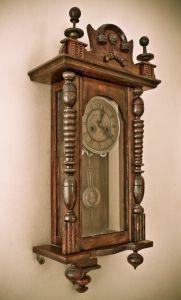 In later years, many clock owners chose to enclose the wag-on-wall clock in a case.